In 1993 the hour record was broken by Graeme Obree, an relatively unknown rider, at least outside Great Britain. In the past years the hour record had been attacked by well known road racing stars. Even more surprising was his “home made” bicycle and his position on this bike. His unique, compact riding position allowed him him to rest his torso on his tucked forearms. In this way, folding his arms under his chest, he eliminated them from the aerodynamic equation. 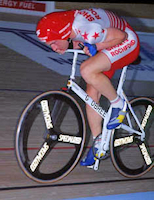 Obree invented the crouched (or tucked) position in 1987, using a standard bike, just flipping the handlebar upside down. 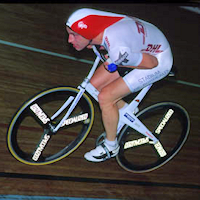 He won national championships in the following years and broke the British hour record. Look at his bike with flipped handlebar on the left picture. In the winter of 1992/1993 he decided to attack Francesco Moser’s hour record and designed a special bike for this purpose. He wanted to have a narrow bottom bracket, and since normal bike parts did not allow that, he used the bearings from a washing machine. 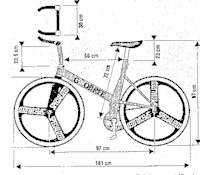 Because of the narrow bottom bracket (68 mm), he rode almost knock-kneed which reduced the drag also, but a normal frame with standard top tube would not allow that – so he invented an X-frame design. Since he was on a low budget, he built the bike by himself, using cheap or used parts wherever possible. The cranks contained a piece of metal found roadside, the handlebar was from a BMX bike, but the overall design was just brilliant and perfect for his needs. Though this position was not very comfortable, wind tunnel measurements showed that it reduced the aerodynamic drag about 15 %, giving a theoretical speed gain of more than 2 km/h at 50 km/h! With the same bike Obree won the 4000 m single pursuit world championships in Hamar/NOR a few weeks later, improving the world record to 4:20.9. In the semi-final he beat Chris Boardman and in the final Philippe Ermenault. In the major time-trial competitions on the road he was not that succesful. Though the low position is a disadvantage on the climbs, where a more upright body is needed, his results were probably just due to bad shape. During the fall and winter a lot of people where experimenting with this position. The famous Francesco Moser was fascinated, built his own version of Obree’s bike and added a chest pad for more comfort. With this bike he attacked the hour record in january 1994 and reached 51.84 km/h, but failed to break Chris Boardman’s mark. But the chest pad gave much more comfort, it was possible to ride longer distances without any problems. The “Jolly” road racing team, sponsored by Moser, was thinking of using this bike for the road time trials in the 1994 season. On the 27th of april 1994 Obree improved the hour record to 52.713 km/h, with almost the same bike he used in 1993. In may 1994 it is to read that the UCI bans the Obree position, but I have no further information which rules exactly apply to this. There was to read that the saddle nose must be 5 cm behind the bottom bracket, but nothing about “folded arms” or something like that. At the world championships Obree showed up again with his famous bike. For the qualifying round he had to change his saddle to match this “5 cm behind bottom bracket” rule. His time qualified him easily for the next round, but after the ride he was disqualified by the UCI officials. As far as I know the reasons for this were not clear: ” Between arms and body the daylight must be seen” was to read in german magazines. Because this rule was not in the UCI rule book before, it was quite clear that the UCI officials invented it quickly to ban Obree. Obree planned to file a lawsuit against the UCI (which he would have certainly won, if my information is correct so far), but nothing has happened to this time. 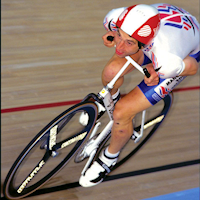 (After winning the world championships in 1995 with his new “superman” position, it was to read that an english lawyer would do it for free) This was the official end of the Obree position in cycling, the most innovative invention since the aero-bar. As for many sports, when stupid officials have the power, a genius athlete like Graeme Obree has no chance.